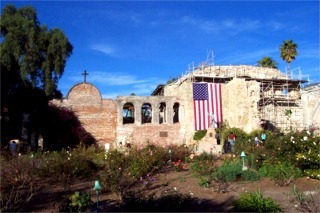 Mission San Juan Capistrano founded November 1, 1776 is the seventh mission of 21 along the coast of California. 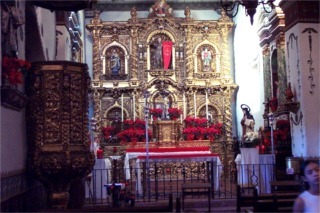 The California Mission Chain was started in 1769 by Father Junipero Serra at the direction King Charles III of Spain. King Charles wanted to establish permanent settlements in Alta California to keep control of the land as other people and countries were beginning to come to the area. Many think they were built to convert the Indians to Christianity and they did perform that function but it was to keep control of the land first. The Missions were built within a days walk of each other. Today this is what remains of The Great Stone Church. 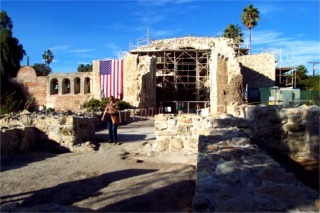 The scaffolding is not for restoration but rather to stabilize the walls from deteriorating any further. The churches would be built as tall as the tallest tree so they could be seen. After Mexico won its independence from Spain, it found that it could no longer afford to keep the missions running as Spain had done. In 1834, Mexico decided to end the mission system and sell all of the lands. This modest little church was built on the property in 1777 and is still in use today. 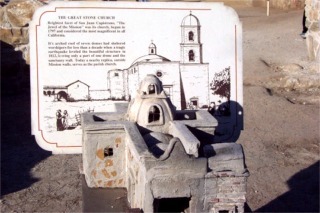 In 1863, President Abraham Lincoln signed an Act declaring that all of the 21 missions in the California mission chain would become the property of the Catholic Church and have remained so since that time. 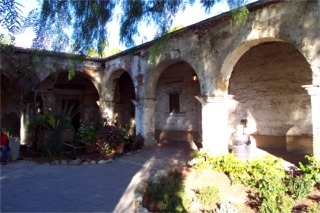 The Missions were an important part of California history and many of her cities were started by Missions. I am not sure of the details but all 4th graders are required to lean of the mission history. Some of the school web sites are a great source for information on the missions. The missions were all similar in style yet different.